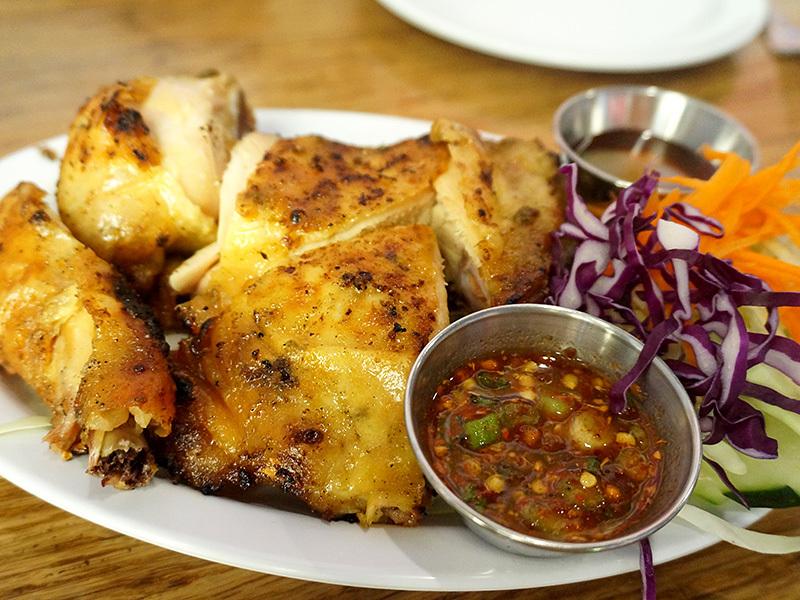 Access to great Thai food is one of the culinary highlights of our trips to Los Angeles. And while Thai Town is not the longest hop from our base at my mother-in-law’s place in Koreatown, and while there are so many excellent options to choose from there, it was very good to hear that there was now a Thai restaurant in Koreatown as well that was receiving strong reviews: Isaan Station. I first heard of it from Sku and then saw a number of promising references on Chowhound and elsewhere. Isaan Station’s menu is focussed, as you might expect from the name, on food from Isaan, the northeastern Thai region abutting Laos and Cambodia. The region’s cuisine is renowned for its heat, pungency and sourness and has more in common with Lao cuisine than with the central Thai cuisine most familiar from restaurants outside Thailand. Well, you could have found out as much for yourselves from a simple Wikipedia lookup—I don’t want to pretend to be an expert for I am not.